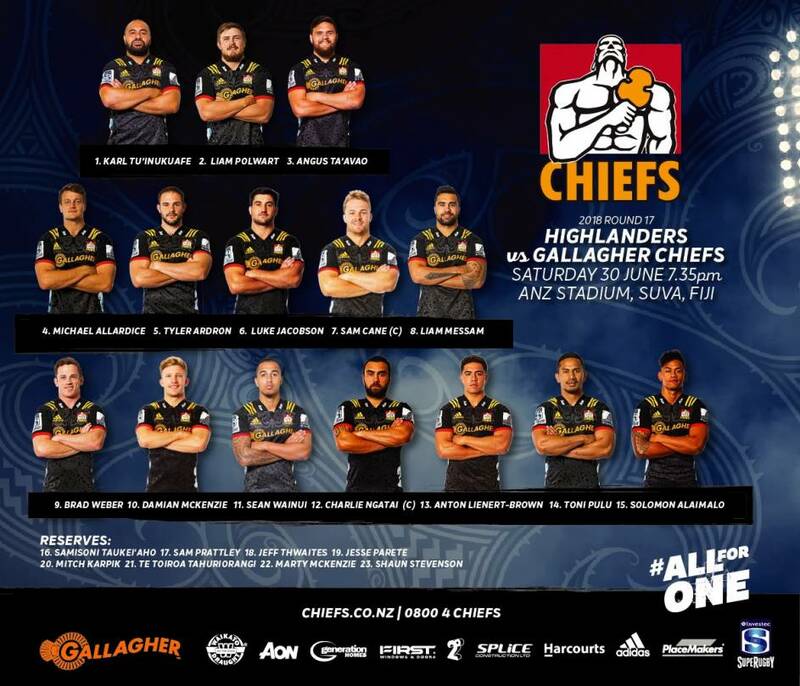 The Gallagher Chiefs are set to take on the Highlanders this Saturday in Suva, Fiji. The team return to Fiji for the third consecutive year, with the Highlanders this year hosting the game at ANZ Stadium in Suva. This highly anticipated match up will be the first since the International June test series break and both sides will be determined to impress and build momentum going into the last three round robin home games before the playoffs. The last time the two teams met was at FMG Stadium Waikato in March, where the Gallagher Chiefs put in a clinical performance to win 27-22. Gallagher Chiefs head coach Colin Cooper is taking positives from the previous game against the Highlanders but knows how tough they’ll be. In the forwards, Karl Tu’inukuafe starts in the front row with Liam Polwart and Angus Ta’avao after his cameos for the All Blacks in the June test series, and Canadian lock Tyler Ardron returns to the side. Impressive youngster Luke Jacobson starts in the six jersey after a highly effective game against the Crusaders, scoring two tries and putting in a dominant performance. Cooper has been impressed with Jacobson’s displays and has seen his growth at Investec Super Rugby level. In the backline, Brad Weber and Damian McKenzie start in the nine and ten jerseys, and Charlie Ngatai and Anton Lienert-Brown link up again in the midfield with Sean Wainui and Toni Pulu covering the wings. Colin Cooper expects an entertaining game in Suva, with the Gallagher Chiefs ready to embrace the challenge.